There are over 100 types of Tumors ("Neoplasms"), non-cancerous ("Benign") and cancerous ("Malignant") that are known to occur in the Head & Neck. 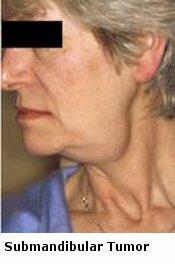 They most commonly grow from the Throat ("Pharynx"), Glands ("Lymph Nodes"), Thyroid Gland (see preceding Thyroid Lumps Web page), and Saliva ("Parotid" and "Submandibular") Glands. 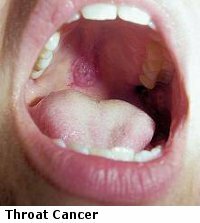 Patients with a history of smoking are much more likely to develop a cancer from their mouth ("Oral Cavity"), Pharynx, or Voice Box ("Larynx"). Having a lump in your Head or Neck, especially one that was not there before, is NOT normal and should be evaluated by your Primary Doctor. 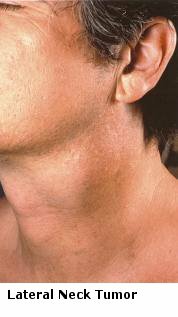 If the lump is concerning a consultation with a Head & Neck Surgeon is usually arranged. If the lump is concerning to your Head & Neck Surgeon a CT scan with intravenous contrast (or sometimes an MRI Scan with contrast depending on the tumors location) is usually obtained in order to determine the size, location, and presence of any other tumors in your head and neck area. In some cases a Fine Needle Aspiration (FNA) Biopsy is also performed to obtain some cells which can be analyzed by a pathologist with a microscope. Our main concern when dealing with a Head & Neck Tumor is to make sure that it is not a cancer ("rule out malignancy"). However, even Benign Tumors are usually removed since they frequently continue to grow potentially affecting the many vital nerves that run through your neck and leading to unsightly appearance and sometimes facial disfigurement.